I use a Vizelex ND Throttle Lens Mount Adapter on my 5D3 with a 645 lens. All links (including utilities downloads) were not working for me either before, but they are now. I just updated my EOS M firmware to the latest, 2.0.3. I went to download the appropriate ML firmware. The ML release says it's only for 2.0.2.
quick questions, has anyone used the ML Firmware on Canon Firmware 2.0.3? you answered your own question. unless you want to try something that might brick your camera. Yes and I find it as stable as 2.0.2. A year ago someone did a pull request and it worked so well that I posted builds made announcements and tried to get users to post test results. The pull request sat there without updates, accumulating conflicts as it fell further behind in development until I decided to post a pull request for 2.0.3 for the bleeding edge crop_rec_4k branch. Well it was a good exercise but it would mean so much more if someone other than me would say that they want it. Come on guys, 452 downloads of the original 2.0.3 update and 70 downloads of the crop_rec_4k version and there is nothing to report? Spec: 5D3 running firmware 1.2.3. (On a Lexar Card 32gb 2000x running 300 MB/s. 2 Komputabay 1000 cards). I think there are few or inadequate instructions or warnings. This is not ML's fault. It is down to the fact that there are so many posts and it is impossible to cross-correlate certain ammends to instructions with warnings. But based on recent experience, please allow me to suggest an edit to a front page to eradicate one stream of issues. Moderators/Admin? Please feel free to edit/update this in your current instructions on the 5Dmkiii' 'installation' instructions (link below). I have recently had a 'stall' where my 5D3 stopped during the install process happen to me so my solution posted here has been 'tested' but I did safely recover by following this process. I wanted to downgrade to 1.1.3 due to many loading/setting up instructions not seeming to be relevant to 1.2.3 and I wanted some of the crop features in 1.1.3. Run the same firmware update that you ran when you installed ML using the same ML file that you used to install it the first time. The firmware procedure will start. On screen Restart camera will appear. Wait so that ML can uninstall (see 'countdown' text at the base of your camera screen). (In every case I suggest waiting until the red light on your 5D3 has finished flashing/writing to card or camera before dropping out batteries or turning it off or pulling any cards out). In my experience, this is from a firmware downgrade from 1.2.3 (or any other firmware). Before you downgrade, after uninstalling ML (see above), as it says, you have to ensure that you set the boot flag to make the SD Card bootable. 1. Format card on PC (must use card reader) - (note: if using a Mac, format using Utilities in the Applications folder) and then format on Camera. 2. Put card back into card reader (PC or Mac) and copy the 5D3-113-bootflag.fir file to the card root directory. Get it here: http://a1ex.magiclantern.fm/bleeding-edge/5D3/5D3-113-bootflag.fir - IMPORTANT: CHECK THAT THE FIRMWARE YOUR CAMERA USES IS 1.1.3 or your camera will go into a 'loop' with the red light flashing and nothing seeming to load and your first thoughts are that you may have bricked your camera. You have not. If this happens to you, AFTER the red light has flashed, turn off the camera and drop out the battery at the same time. 2a. Install/downgrade the firmware that you wish to downgrade to by formatting your card (as above) and by installing ONLY the firmware .fir file on your card. Run the firmware update as per Canon instructions. 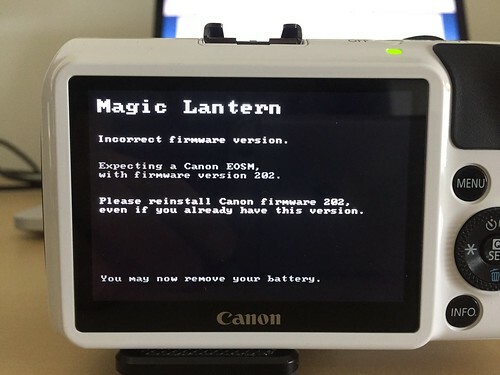 Note: You cannot download older firmware updates from the Canon site. You must download any older .fir files from other websites. After firmware downgrade, check on your Canon screen that it has installed. 3. Put the card back in Camera and go to the Firmaware update section (Canon Menu) do an update with the 5D3-113-bootflag.fir Make sure you have a full battery, a dead battery during any firmware update could be a disaster. 4. Once the firmware update is finished you have set the bootflag on your camera. Install 1.1.3 as per instructions her on the forum. Sorry, kudos for effort but your instruction does contain several flaws. In general I think your procedures are overcomplicated, using outdated files and unneccessary steps. Next week I have some time to look into peer-review enabled manual/help text platform. Hope seeing your input there, soon. Home page -> Download -> Download nightly builds -> select camera model and firmware version -> Installation. Should I change anything to the main page to make it obvious this is the recommended installation procedure? Should anything be changed in the short install guide? The guide at http://wiki.magiclantern.fm/install is... well... a wiki page, editable by any forum users. Hi Walter. My instructions were the same instructions from RenatoPhoto; suggestions came from my experience following them and didn't want people to miss the point not to load the 1.1.3 boot .fir unless you have the 1.1.3 .fir firmware installed. Been using ML for (has it been a decade)? 50D, 550D, 70D and recently going back to the 5D3 to experiment even more with this stuff so I will defiantly call in and check your peer-review enabled manual/help text platform. I patted myself on the back when I got a 14 bit 1920x818 file (About as high as I can get on a Nightly Build (but 14 bit? Bravo, ML). Admit, getting 4k to work on my 5D3 has been finicky and I cannot match the results some people are getting <yet> and there is, as you put it, 'inadequacy' and 'flaws' but what part of 'experimental' in the term Experimental Build would be devoid of those? Solution? Report. Wait. PS: I used to write tech manuals if I can be on any help in my spare time (currently 'spare time' being between midnight and 7 in the morning although have been known to work during sleep). I'm not exactly a friend to sloppy and outdated tutorials (video and text) spread all over the place. @RenatoPhoto: Can you clean this up? spread all over the place. Are you guys able to edit the wiki? Just wanting to make sure the lack of activity in that area is not caused by login issues. Just tried to log in. No success. what does "no success" mean? any error message appearing? "Sorry, username or password was wrong." Had to reset pw for second account (forgotten). Login to wiki successful. Page edit successful. I would like to first thank all those who worked so hard and developed this wonderful (ML) software, and keep improving it constantly; I am a huge fan! If I may, though, I would like to suggest, if it's at all possible, not to let hap-hazard directives and how to's spread in too many places over the Internet because searching for something specific endlessly may end the search before something is found due to lost energy. Case in point: the Dual ISO software and its ability blew my mind but, took me about four days of searching all over the place, installing the nightly, turning on-and-off the camera endlessly before I was able to take a Dual ISO picture, install the Lightroom CC 6.14 plugin, Export the picture, and then drop it into CR2HDR. I am still not sure 100% how to do this right or, how I did it in the first place. Can someone please write a concise step-by-step directive on the Dual ISO from A - Z ? How to take the picture, ways to post-process it, how to open the picture to enjoy it. Thank you. my firmware is slightly too new for the latest build... should I do it? I have the Rebel T4i and thinking of putting the latest version of magic lantern on it with firmware 1.0.5 and the website is reccomending 1.0.4 firmware. Has anyone tried this yet with success? Re: my firmware is slightly too new for the latest build... should I do it? Has anyone tried this yet with success? No. The install page doesn't say "Make sure you are running Canon firmware 1.0.4." for no reason. Unless you want to jump into the deep end and try out an experimental build. I've got a build for the Rebel T4i, a.k.a. 650D, 1.0.5 firmware on my Bitbucket downloads page. Look for "650D105" in the filename. Any reason the nightly builds have been stuck since July 2018?